I recently received Mirror’s Edge in the mail from GameAccess.ca, which is where I’d borrowed Final Fantasy XIII from — it would be the very definition of “unwise” to buy a game I’d heard so many bad things about. So, in my grand tradition of reviewing games based on only a couple of hours of gameplay, today’s post will be about Mirror’s Edge. 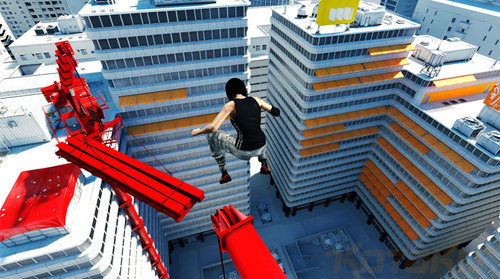 Mirror’s Edge is, by and large, a running and jumping game in the first person. If you like parkour, the game is pretty much like extreme parkour where every so often people with guns are trying to kill you as you run along the rooftops. For some reason, every time I see the intro, I can never retain any of the information about the background for the plot. It must be all of the empty metaphors and flowery wording that Faith uses. My brain just tunes out and doesn’t catch any of it. What I did catch is this: the city’s police force has become incredibly corrupt and controlling. In this new regime, “Runners” form something like a small delivery network that runs along the rooftops of the city. For the most part, they stay out of the way of the police and the police stay out of their way. Until today. You are Faith. You’ve just gotten back on the job and your first gig back is supposed to be low-key. However, the “Blues” start firing guns on you immediately and you are instantly a fugitive on the run. There’s a conspiracy plot, with ringleaders trying to maintain the status quo and a project known by the codename “Icarus”. Your sister is even being implicated in the death of an important candidate for mayor. You must dash through the city, climbing, jumping, and sliding between rooftops and into and out of buildings as you try to reach the truth. When you’re doing it right, Mirror’s Edge has very fluid gameplay. There’s something immensely satisfying about sliding under a low clearance obstacle, running along a wall and kicking off of it to climb up a rooftop so you can dash across it and vault yourself into the air towards the next building, bracing yourself to roll when you hit ground. In short, Mirror’s Edge is “Parkour: the Video Game”. You just keep running and running and running, and don’t let anything stop you from doing so! There are usually a couple of ways of doing the same thing, so you can replay a level to try and race through it for a better time or try to get through it without getting so much as grazed by a bullet. The game provides plenty of trophies to go for, some of which award some very specific chains of moves. I managed to nab “Free flowing”, which is awarded for chaining a wallrun with a jump and a speedvault. The graphics are pretty good and the game makes interesting use of the colour red as a cue for various things that Faith can use to her advantage. A couple of small objects on the ground may glow red as you get closer to them to signal that you can use them to vault over the barbed fence ahead. The game demands the utmost precision, even for a normal play-through of the story mode. Be prepared to just miss grabbing the edge of the next building because you weren’t running very fast and you hit the jump button just a bit too soon. There are many spots where I’ve died over and over again because I was turned just a bit too much to the left or a bit too much to the right. I’d watch Faith bump into or otherwise pass through the thing that she was supposed to be grabbing next and hang my head in sadness before tightening my grip on the controller to try it again. Sometimes, details that really should be made clear are not so. I’m not sure if this is intentional or not but much of the time I can’t tell the difference between a normal fence and a fence that has incredibly high voltage passing through it. Jumping into an electrified fence isn’t necessarily an instant kill if you get away fast enough (suspend your disbelief) but it’s still quite a pain. I can’t get myself to care much about the story. The conspiracy plot has a bit of intrigue to it, but it’s pretty much a frame around which levels are placed. It’s like the story willfully bows out of your way so you can get to the running and jumping again. You can tune in if you want, but it isn’t incredibly engaging in its own right. The control scheme can be somewhat confusing at first. Most of your actions are actually on the trigger buttons rather than on the main four buttons, which might be counter-intuitive if you’re used to pressing X to jump. L1 and L2 perform jumps/climbs and slides/rolls, respectively, while R1 spins you right around and R2 executes attacks (including firing a gun if you have one). Mirror’s Edge is a neat little concept and I would definitely consider adding this to my collection — particularly because it’s one of the cheapest disc-based PS3 games out there now. If you like parkour or running, you’ll probably really like this game. If you get really frustrated in platformer games when you just ever-so-slightly miss the platform over and over again, this game probably isn’t for you. This entry was posted on at 10:00 pm	and is filed under Video Games. I probably should do much the same, rent rather than buy, since I’ve bought a few games (Assassin’s Creed) on word of mouth and hardly ever played it before trading it in to get something else.